ManPak - HD SNG live transmissions. Outside broadcast and satellite uplink specialist, SIS LIVE will reveal the latest addition to their innovative product range at CABSAT. 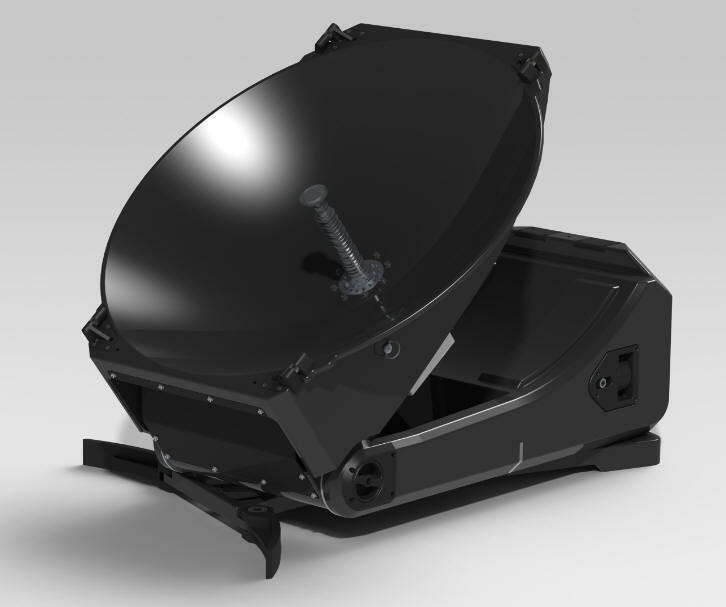 Weighing in at just 12kgs, ManPak is an integrated and compact VSAT terminal that provides a high bandwidth connection capable of high speed data and HD SNG transmissions. Extremely rugged, portable and fully integrated, ManPak is the only terminal of its type without any loose parts. The unit features a high performance 60cm parabolic antenna, and can be used in X, Ku and Ka bands. ManPak is very easy to use, offering assisted acquisition via its award-winning software and GUI. ManPak’s Cartridge Modem system allows for complete flexibility supporting multi-formats including iDirect. The simple design allows for rapid deployment, making it ideal for fast responding newscasters, disaster recovery, emergency services, military and special operations. This unit can be comfortably carried in a rucksack / bag across rough terrain and checked in as airline baggage, being fully IATA compliant and exceptionally light. It can be powered by AC adapter or 24 VDC with ‘hot-swappable’ MIL batteries, is weatherproof to IP65, and MIL STD 810F compliant, enabling transmissions to take place in difficult environmental and hazardous conditions. ManPak is exceptionally easy to use, has a high gain, is multi-band, can acquire and be used on any satellite using SIS LIVE’s award-winning GUI, and can be out of its bag and operating live in less than three minutes. ManPak will be demonstrated at CABSAT in Dubai and launched at NAB in April. Also on display at CABSAT will be uPak® 60, a fully automated lightweight, flat plate VSAT terminal, Tr-uPod®, a compact tripod satellite uplink system, uPod®, an automated drive/fly system and RouteCase®, the powerful, compact and affordable 4 channel HD/SDI production unit. These products have been developed and built in-house by the SIS LIVE design team based on specific requirements identified and feedback gained in the field.